A while back made a "fun" placement chart for work. Work at a courier company; the name of it is close to the one in the image below. If there was a coffee machine still on the counter in the lunch room at work this would make a good logo for it. A placement chart just shows where each dock employee is working that shift. I'm sure you're not interested in the minutiae of the internal set up of the night dock at work so I'll spare you those details. The usual placement chart while serving it's purpose is rather dull, so I made a video game themed one. I think the last time it was used was on a dock employee's last day at work before he transferred to another city. I just found pics of the girders and ladders online - they aren't the best quality images at that size but they do the job. 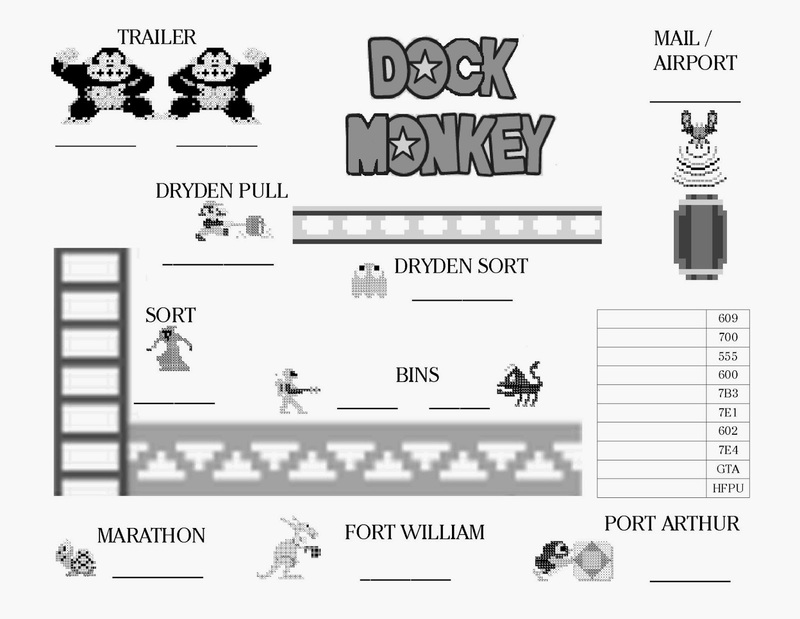 Modified a Donkey Kong logo to make it Dock Monkey. It can be taken as a term of derision for the dock employees, the lowest guys on the totem pole at the company, but it has been adopted many of the dock guys to describe their jobs.